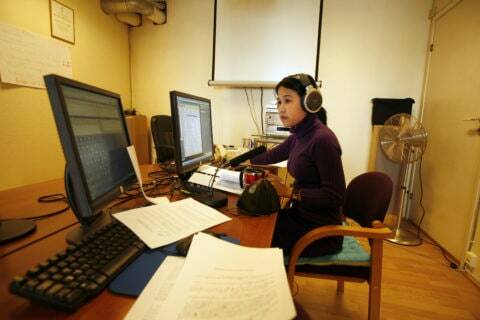 Democratic Voice of Burma journalist Thida broadcasts live via satellite from Oslo to Burma. Democratic Voice of Burma (DVB) is a radio and TV station run by exiled Burmese. In opposition to the ruling junta, the DVB has been broadcasting from the Norwegian capital of Oslo into Burma (Myanmar) since 1992. “Urgent steps are required to implement the promises made through HRC Resolution 33/2 at the national and local levels. We urge government actors at the national level, as well as civil society, to make use of this guide to push action to prevent, protect against and prosecute attacks on the press,” Hughes added. The ARTICLE 19 guide was formally launched on 26 September 2017 at the inaugural meeting of the Geneva “Group of Friends” on the safety of journalists. This inter-governmental group, formed almost one year to the day since the HRC adopted resolution 33/2, complements parallel groups at UNESCO in Paris, and at the UN in New York, and should enhance inter-governmental coordination to ensure the safety of journalists, bringing Geneva human rights mechanisms to the centre of these efforts. UN resolutions, including on the safety of journalists, are complex documents, and ARTICLE 19 recognises that their form and legalese substance can be a barrier to their effective implementation, and to engagement on them from civil society and the public. Though HRC resolution 33/2 includes various ground-breaking standards and commitments, they only stand a chance of being implemented if the national and local actors working to enhance journalists’ safety know about and use these standards to affect change. Launching the guide to the Group of Friends, ARTICLE 19 emphasised the positive role States at the UN in Geneva can play in elevating the role of UN human rights mechanisms as an integral part of the UN’s broader response to this issue. Lack of cooperation from States with these mechanisms is the greatest obstacle to their effectiveness, and also a significant challenge to ensuring the safety of journalists. Ahead of HRC elections in October at the General Assembly in New York, ARTICLE 19 stressed that full cooperation with UN special procedures should be a pre-condition to HRC membership.